Bupleurum Chinense, Angelica Sinensis, Cynanchum Otophyllum, Atractylodes Macrocephala, Poria Cocos(Schw.) Wolf, Radix Glycyrrhizae Preparata, Cortex Moutan, Gardenia Jasminoides, Mentha Haplocalyx Briq. 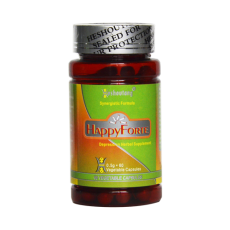 HappyForte is formulated for smoothing liver energy to relieve anxiety, depression and also serious reflux from liver energy attack. There are over 1,000,000 people have got stomach benefit from HappyForte in different countries.